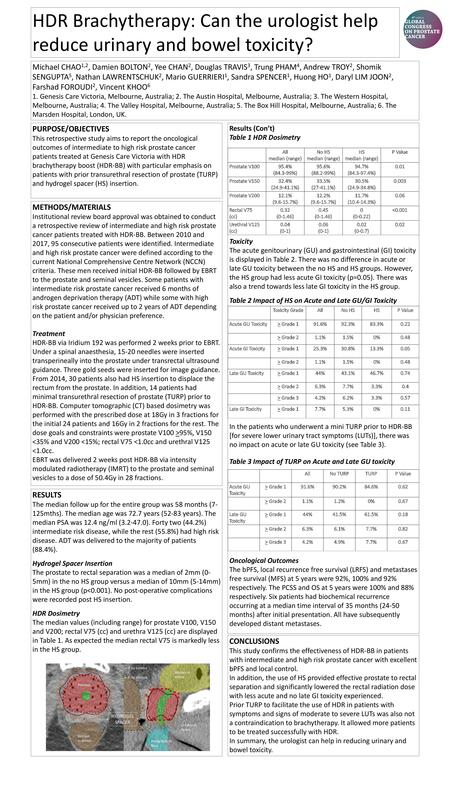 This retrospective study aims to report the oncological outcomes of intermediate to high risk prostate cancer patients treated at GenesisCare Victoria with HDR brachytherapy boost (HDR-BB) with particular emphasis on patients with prior transurethral resection of prostate (TURP) and hydrogel spacer (HS) insertion. Between 2010 and 2017, 95 consecutive patients received initial prostate HDR-BB via Iridium 192 (16-18 Gy in 2-3 fractions) followed by EBRT (50.4Gy in 28 fractions) to the prostate and seminal vesicles. Some patients with intermediate risk prostate cancer received 6 months of androgen deprivation therapy (ADT) while some with high risk prostate cancer received up to 2 years of ADT depending on patient and/or physician preference. In addition, 14 patients had prior TURP for moderate lower tract symptoms and 28 patients also had HS inserted at HDR implant from 2014 onwards. The median follow up for the entire group was 58 mths (7-125mths). The median age was 72.7 years (52-83 years). The median PSA was 12.4 ng/ml (3.2-47.0ng/ml). The overall mean and median prostate V100 was 94.8% and 95.3% (range 84.3-99.0). The overall mean and median urethral V125 in cc was 0.15 and 0.04 (0-1.01). The overall mean and median rectal V75 in cc was 0.34 and 0.33 (0-1.36). The use of HS was associated with significantly lower rectal radiation dose with a mean rectal V75 in cc of 0.46 without HS and 0.04 with HS (p<0.001). The bPFS, local recurrence free survival and metastases free survival at 5 years were 92%, 100% and 92% respectively. The incidence of late grade 3 urinary toxicity was 5.3% with urinary retention occurring in 4 patients and severe haematuria in 1 patient. None of the 14 patients who had a prior TURP developed late grade 2 or more urinary retention. The incidence of late grade 1 bowel toxicity was 5.3%. No patients developed late grade 2 or more GI toxicity. The risk of late grade 1 GI toxicity was 7.5% without HS versus 0% with HS (p=0.14). This study confirms the effectiveness of HDR-BB in patients with intermediate and high risk prostate cancer with excellent bPFS and local control. In addition, the use of HS significantly lowered the rectal radiation dose with no late GI toxicity documented in this cohort. Prior TURP was also not a contraindication, with no patients developing late grade 2+ urinary toxicity.